Equisales offers a comprehensive inventory of high-voltage equipment that is ready for immediate shipment to global clients. Custom engineering, building and rebuilding services further extend our fast-track capabilities. From sales and assembly to installation and testing, we supply transformers, circuit breakers, switches and components for substation construction and energy projects. Our products and professional resources are ideal for fast-track power projects in the utility, energy and petroleum industries. Profit from our experience in handling late-stage setbacks and responding to emergency calls. We have helped regional IPPs and global energy corporations avoid penalties and meet tight deadlines by completing emergency repairs and commissioning replacement parts in as little as 10 days. Clients partner with us to access an extensive array of in-stock parts, custom-engineered transformers and additional high-voltage equipment that is available within our supply network. We have the resources and capital needed to supply and transport time-critical equipment, mobile vacuum filling units, technicians and engineering teams worldwide. Our inventory and capabilities include the following. We stock more than 600 high-voltage transformers ranging from 5 to 100 MVA. With multiple vector groups and winding configurations, our in-stock products meet or exceed design specifications for most distribution and transmission applications. 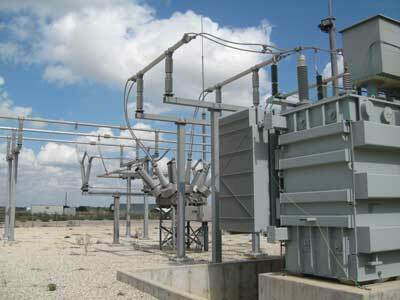 We have the capacity to assemble and install transformers and complete maintenance in the field. For large-scale and specialized projects, our design and engineering teams will build transformers that meet your specifications, schedule and budget. We offer high-voltage equipment sales, customized transformers and rentals that deliver flexible, cost-effective solutions to clients in all sectors. Partner with us to benefit from quality substation equipment, engineering professionals and high-voltage solutions that streamline fast-track projects everywhere from North America to new markets in Africa and Asia. Purchase new and refurbished equipment for fast-track substation construction, upgrades and grid expansions. Our in-stock inventory and global supply network gives you access to all types of high-voltage equipment, including transformers, circuit breakers and switches. Our design and build teams offer customized high-voltage transformers and substation configurations for demanding utility and energy applications. Broad capabilities in engineering, procurement and construction management lead to faster build times on large-scale and integrated projects. When engineering specifications surpass in-stock availability, we deliver customized products promptly and with competitive prices. Increase financial performance with long-term and emergency rentals. When repairs are recommended, use short-term rentals to cut downtime and lower one-time costs while faulty components are replaced. Increase profits by selling end-of-life equipment to Equisales. Use funds to purchase new equipment when a replacement is the best option. Our professionals install high-voltage equipment quickly. Field technicians are standing by to assemble and calibrate new equipment anywhere in the world. Mobile vacuum filling units, oil processing trailers and vacuum dehydrators allow teams to complete technical services and substation testing at remote sites. We have the resources needed to provide substation equipment and rapid turnarounds on fast-track projects in all markets. Call our Houston office at 713-733-3999 to request specific equipment or to discuss your requirements.